Mauritius als Investment Hub und Tor zu Afrika. Die geographische Lage, die politische, soziale und wirtschaftliche Stabilität die Mauritius bietet, gibt globalen Investoren die Sicherheit, die sie für Ihre Investition in Afrika benötigen. Wir würden Sie gerne für den 5. September 2018 zum Business Forum im Intercontinental Frankfurt einladen. Sie würden gerne mehr erfahren? Füllen Sie bitte diese Formular aus. 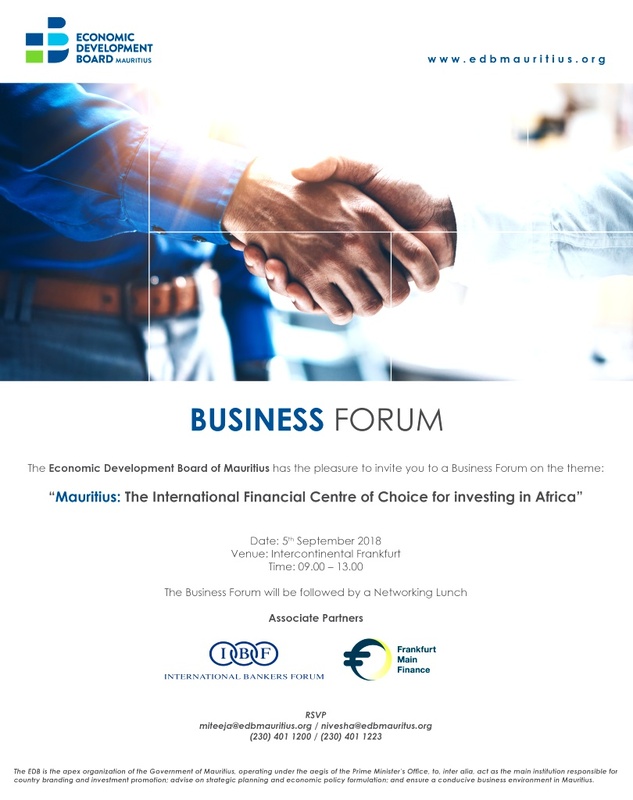 The Economic Development Board is conducting a promotional mission in Germany, scheduled from the 3rd to the 7th of September 2018, to enhance the visibility of Mauritius as an International Financial Centre of choice and substance. The prime objective of this mission is to strategically position Mauritius as a hub for doing business in Africa. The mission comprises participation to the MES & DAK Germany 2nd Finance & ICT (FinTech) Summit, which will be held on the 3rd of September 2018 in Frankfurt. This Summit aims to attract the Germany-based SMEs to use Mauritius as a platform to invest in Africa. Around 150 decision makers and C-level executives from, inter-alia, the financial services sector, SME associations, family owned enterprises association and the Chamber of Commerce and Industry are expected to attend the Conference. The EDB will administer a booth and a presentation on the Mauritius IFC will also be made during this conference. The EDB has also negotiated for 15 complimentary access passes for the Summit, which will be provided on a first-come-first-serve basis to participating companies. In addition, the EDB will host a Business Forum, on Wednesday 5th of September 2018, in Frankfurt, targeting around 60 people in the German business community, including tax advisors, law firms, wealth managers, family offices and MNCs.